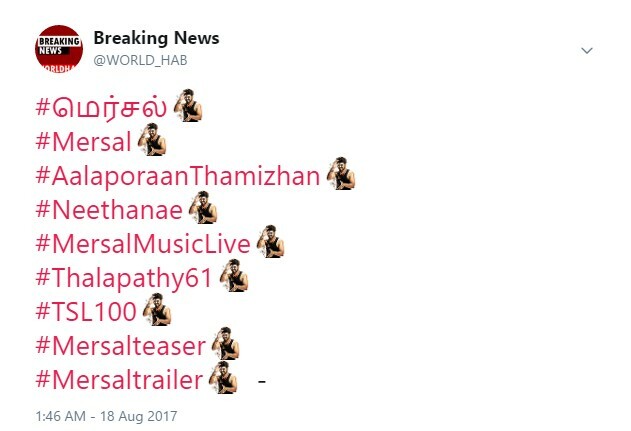 Mersal Twitter emoji is officially launched at 02 pm on August 18th Friday. This is the first time in South Indian films history. No other films have such a promotion yet in all south Indian cinemas. The members of the Sri Thenandal Films production Hema Rukmani‏, Murali Ramasamy are happy with this new promotion along with Twitter. UPDATE: Mersal songs officially launched: Listen all the Songs on Saavn and Download Mersal Songs officially. Check with the hashtags of #Thalapathy61 #Mersal #TSL100 #AalaporaanThamizhan #Neethanae #MersalMusicLive #Mersalteaser #Mersaltrailer . Fans can also check this with the Tamil language. This is biggest surprise to all the Ilaya Thalapathy Vijay fans across the globe. Mersal emoji is now trending all around the corners. Meanwhile the Sony Music India also enjoying the healthy competition of Vivegam and Mersal. Vivegam official trailer has broke all the records in Tamil cinema.